Having a dog is more than just fun. According to LoveToKnow's guest columnist Wendy Nan Rees, they can actually provide health benefits to our elderly loved ones. When my Grandmother was still alive, after my grandfather passed away, her two biggest joys were when my sister and cousins' children came to visit and me bringing the boys to visit her. I would go every Friday to see my grandmother, and I went almost every day with Cappy towards the end of her life. The joy it brought her and the other people where my grandmother lived at the Motion Picture Home was so incredible that I still continue visiting today. What is so incredible is the sheer joy my bringing Cappy to visit brings to all these wonderful people. What is important to remember is that all of these people were very important to our society. They developed some of the best loved TV shows and movies of the past 50 years, and yet most of us have really forgotten about them. Here in Hollywood it would seem this is a very young town, and growing old in Los Angeles is a very hard thing to do. When I bring the dogs out to the home, it brings the people out of their homes to play, walk and talk with each other. To see them interact with each other is a lovely thing after knowing they have been lonely and feeling they have been forgotten. Yet dogs don't care how old you are or who you are. They just love you and offer that affection unconditionally. That is why our dogs are such wonderful companions. They just want to please us and love us. So I ask you, can our pets benefit the elderly? The answer is yes! And the facts are right here. A study I found shows that time spent with your dog can be wonderful, not only for your physical health but your mental health as well. Elderly people who find themselves alone can feel young again and find meaning in their lives by adopting a friend from a local shelter. The unconditional love they get from having a pet enhances their lives as they grow older. Instead of feeling incapable, they now have a reason to get up and do things because they have someone to take care of again. Owning a dog also helps lower a person's blood pressure and cholesterol levels. 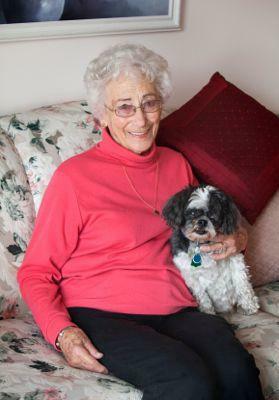 Studies show that having a dog increases survival rates in the elderly. Dog walking, pet grooming and even petting provide increased physical activity that strengthens the heart, improves blood circulation and slows the loss of bone tissue. They now have proven without a doubt that owning a dog is good preventive medicine, and it will help improve the quality and length of your life. Pets aren't just good friends, they are good medicine. If you are considering adopting a dog for your grandparents or an elderly person in your life, there are a few reasons it is a good idea to adopt an older dog rather than a puppy. Calm, already house trained and less susceptible to unpredictable behavior, older animals are often more easily physically managed by elderly persons than stronger, excitable younger animals; yet older pets still confer the same medical and emotional benefits on their owners as younger animals do. Animal shelter staff can help potential adopters find the most suitable animal for their lifestyle, ensuring a great match between pet and person. If you already own a wonderful dog and want to get out with your pet like I do with my boys, you can go about it in a few ways. You can go through a class to become certified to work with your pet as a therapy dog. After graduation, your dog will receive a certificate and a special vest that certifies him as a qualified therapy dog. This in turn allows you both to go into hospitals and retirement homes to volunteer and give of your time. If you do not want to do that much, you can go down to your local retirement home and see what their rules are and whether they would be willing to have you and your dog to come in once a month to visit patients.. If you have grandparents or elderly in your own life, you can start something privately yourself like I did. However, you must know your dog is able to be quiet, and you must be extremely sure your dog is well trained, well socialized and you and your dog should have at least completed a basic training course. Your dog needs to understand and obey the commands sit, stay and come, and he must be very good on a leash as well as being happy to meet other people including complete strangers. If you and your dog are in sync with all of that, you are ready to get out and help make a difference. It will make you and your dog feel great, and most of all it is going to make your new friends feel wonderful and remind them they do still matter.